I have always looked at the Festool MFT (Multi-Function Table) as great little work table, but not practical for jobsite use. I just never liked the idea of having to carry it around on the jobsite along with all of my other tools. 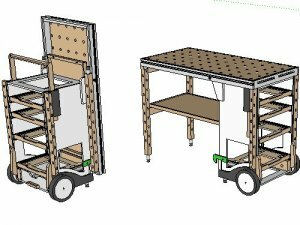 But Timothy Wilmots' modified MFTC (Multi-Function Tool Cart) looks like an ideal way to transport both the MFT and your tools. Timothy Wilmots is a woodworker in Belgium who spent 10-months designing and engineering a way to turn his Festool Systainers and MFT into a more practical jobsite cart after growing tired of having to work on saw horses or the floor. What he came up with is a cart to hold his Systainers that also features a fold-up MFT top. When folded, his MFTC takes up about as much room as a folded up portable table saw; but when fully expanded, the MFTC is a fully functional work cart and MFT. You will want to watch the video to see the MFTC in all its glory. 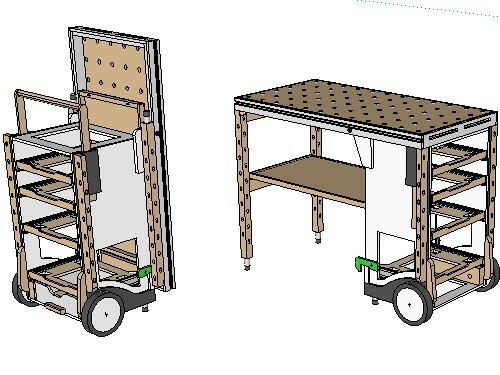 If you are interested in building an MFTC of your own, you can pick up the plans on Timothy's website for under $10 US. 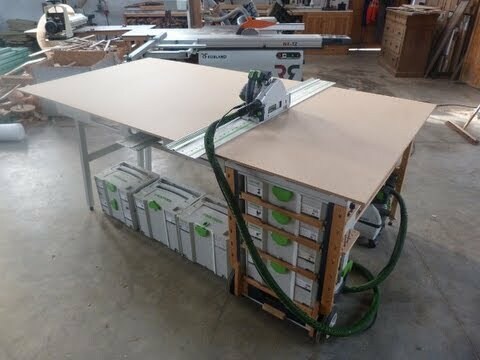 Of course, you will also have to purchase a Festool MFT, Systainers, and other materials to complete the project.